If you've been following along with this series, prepare yourself for a book that is not like the others. Sebastian matches his sin 100%, he's completely indulgent in every aspect of his life and not going to lie, he terrified me. I can't say that I've been looking forward to his story, but now that I've finished this, I'm a bit at a loss for words. Now I didn't hate this book, but it definitely sums up to something that I don't tend to read at all. It seems like Forgy has a knack for these kind of reads and she does it so well ... if you're into those. Envy felt so different than the rest of the books in this series like it almost didn't match up with them at all. I kind of felt disconnected from the series in general and it left me a bit confused on what's going AND what will happen with the rest of the guys whose stories we still have to read. There was a cliffhanger in Wrath and now, Envy. And I'm just wondering what the heck happens now? I have so many more questions that don't exactly pertain to the Elite Seven (as a whole) at all. Also, I couldn't tell you the last time I read a book that had zero romance. This book definitely brings you inside the dark and psychotic mind of Sebastian and how he became a part of the Elite. It's pretty demented and just absolutely crazy. He's all of that. The one thing that I wish wasn't happening in every book so far is all the rehashing of everything from getting into the school, the Elite and the series of events that goes on with the other guys. It's becoming a bit redundant and I feel like that's what the first half of the books cover. Even though this wasn't for me, I'm still 100% invested in this series because I have to know what happens to everyone. I have no idea what will come of Sebastian especially after the way everything ends, but we definitely haven't seen the last of him. 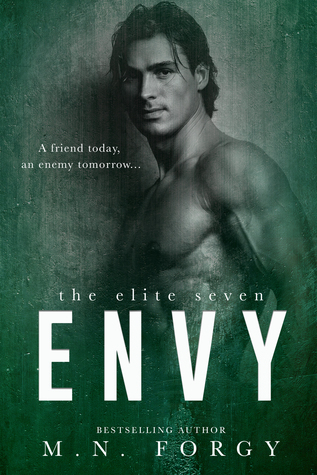 Sign into Goodreads to see if any of your friends have read Envy. I gave it 5 stars. I thought it was well written and conveyed his psychosis well but I completely agree it was a very different feel from the others. Which is ok! But i think how they wrap it in to the mix will be the deciding factor on where I land on this one.